In the frozen lands of the northern continent proud warriors recite the deeds of their ancestors; intrepid explorers cross the storm-wracked oceans or delve into Ertha's dark realm; clerics invoke miracles with the power to affect hundreds of lives; and powerful organizations strive to make the land a safer place. And now your heroes can join them! The Rassilon Expansion 2 builds on the Hellfrost setting adding new information and bringing older material to print for the first time. new options for player characters including Edges, Hindrances, gear, Arcane Background, and spells. Setting rules for ancestry, collective faith the effects of elevation on temperature, exploring the turbulent seas and dark underworld, a new type of relic, and traditional sports. And expanded bestiary with over 100 additional foes. 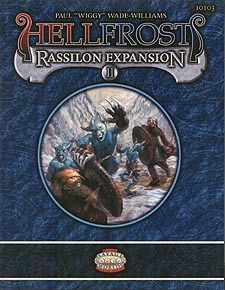 This book is designed for use in conjunction with the Hellfrost Player's Guide and Hellfrost Bestiary.